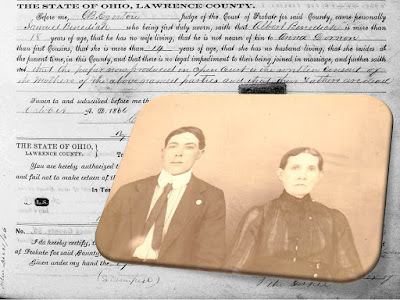 In the years immediately following the end of the Civil War, two brothers - both Union veterans - returned home to Lawrence County, Ohio and married. Neither brother traveled outside the county to marry. In fact, neither brother searched for their significant other outside a single family. Albert Benedick, my third great-grandfather, and his older brother George Washington Benedick, married two sisters: Anna Dornon, my third great-grandmother, and her younger sister Abigail Dornon. 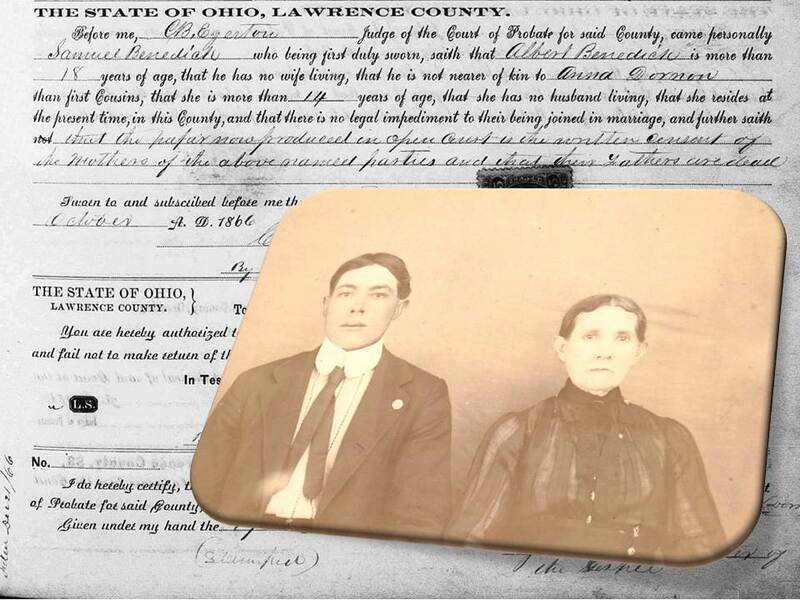 It shouldn't come as a surprise that a man would marry someone near home in the 19th century. After all, as Richard Conniff noted in his article Go Ahead, Kiss Your Cousin, "Until the past century, families tended to remain in the same area for generations, and men typically went courting no more than about five miles from home—the distance they could walk out and back on their day off from work." In the early 20th century, two Benedick sisters carried on their grandfather's tradition and married two brothers from a single family. 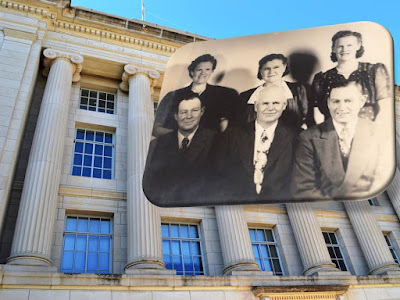 On August 18, 1929, Della Benedick married Irwin Roy Lumpkins at the courthouse in Stockton, Rooks County, Kansas. The local paper - the Plainville Times - reported that, "Miss Benedick wore a blue silk and lace gown...and carried a bouquet of pink roses." Della's younger sister, Nevella Benedick, married Roy's younger brother, Marion Lumpkins, on Valentine's Day 1934. The Plainville Times reported that my great-grandparents "were married by Probate Judge Case at Stockton" in the same county courthouse as their siblings. Rooks County, Kansas Courthouse where they all married. Perhaps because of the proliferation of the automobile and increased mobility, my family has not seen another marriage between sets of siblings of two families. What did your family's small town marriages look like? Any sets of siblings tie the knot? I have had that phenomenon in my family many times---siblings marrying their sibling's sibling. In my case I think it was for similar though somewhat different reasons. There were so few Jewish families in the towns where some of my ancestors lived---both in Europe and in the US---that it was not surprising that there were these overlaps in the family marriages. Great post! That's a good point. Smaller population sizes certainly contributed to multiple marriages between the same families. 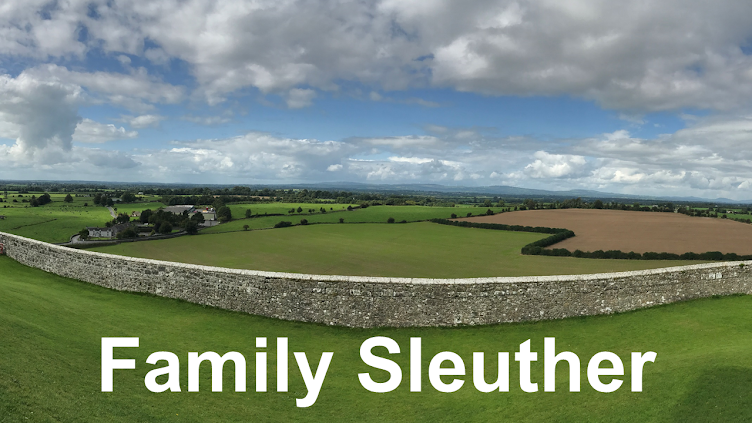 In fact, it may seem quite novel to us now but was likely much more common a few generations ago - as you've seen with your family. This runs thick on my paternal Grandma's side of the family because she was from a very small town! From everyone's comments here and on social media, I'm learning this was quite a common occurrence. It certainly brought families closer together...doubly so! I see the same phenomenon in my West Virginia families. Their lives were full of work from dawn to dusk. They met at church or at the general store or at a neighbor's. I suppose finding a spouse from within a tight knit community helped you have a better idea about who they were and what they were like (or at least their family). Maybe. I do my photo editing in PowerPoint. Not what it was intended for, but it's easy and works for me - usually. Thanks for the compliment!